ATLANTA (April 12, 2017) – There are still 271 days until Mercedes-Benz Stadium hosts its first College Football Playoff (CFP) National Championship, but the event’s impact is already being felt across Atlanta. At a news conference today to announce the game’s annual fan events, the proceedings took an unexpected turn when 40 students and their teachers from Atlanta’s Scott Elementary School were surprised with a gift that will transform a classroom into a cutting-edge learning laboratory. 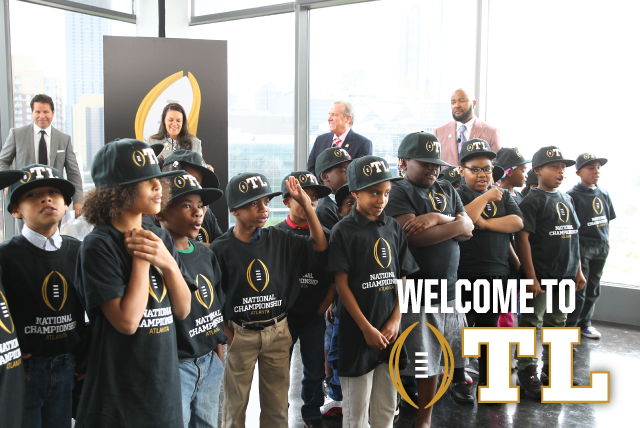 The Atlanta Football Host Committee and the College Football Playoff (CFP) Foundation have partnered to fund Atlanta’s first Creative Learning Systems SmartLab through the CFP Foundation’s Extra Yard for Teachers platform. The donation, which totals $75,000, will be made in honor of the Scott Elementary faculty. Steve Beasley and Legena Crawford, who chaperoned their second-grade students to the event, accepted the unexpected gift on behalf of their colleagues. The facility will allow Scott Elementary educators to lead their classrooms in the exploration of a wide range of applied technologies, including robotics, software engineering, mechanics and structures, computer graphics, digital media arts and more. Extra Yard for Teachers aims to elevate the teaching profession by inspiring and empowering quality teachers. In its first three years, the CFP Foundation impacted 97,407 teachers through the Extra Yard for Teachers platform as well as over three million students in 12,902 schools across the country. The CFP Foundation and its partners have been responsible for $11.8 million in support to causes impacting the teaching profession. In addition to the announcing the grant, the news conference – which was hosted by college football broadcasting legend Brad Nessler – also outlined a full slate of fan events that will herald game week. For complete details on these events, please see attachment or visit www.ATLChampGame.com. The 2018 College Football Playoff National Championship will be held on Monday, January 8, at Mercedes-Benz Stadium in Atlanta. Formed in 2016, the Atlanta Football Host Committee (AFHC) serves as an extension of College Football Playoff administration in the local community. The organization is responsible for assisting with the planning and production of the 2018 College Football Playoff National Championship and accompanying fan events. The AFHC is comprised of local leaders in business, sports and tourism and its mission is to host a one-of-a-kind Championship experience for student-athletes, university representatives, media and college football fans. For more information, visit: www.ATLChampGame.com. The College Football Playoff matches the No. 1 seed vs. No. 4, and No. 2 vs. No. 3 in semifinal games that rotate annually among the Chick-fil-A Peach Bowl, Goodyear Cotton Bowl, Capital One Orange Bowl, Allstate Sugar Bowl, Rose Bowl Game presented by Northwestern Mutual and PlayStation Fiesta Bowl. This season’s semifinals will take place Monday, January 1, 2018, at the Rose Bowl presented by Northwestern Mutual and the Allstate Sugar Bowl. The College Football Playoff (CFP) Foundation is the charitable arm of the College Football Playoff and supports education and teachers across the country. The CFP Foundation creates multiple partnerships to execute its initiatives and support positive educational outcomes. The Foundation’s primary philanthropic initiative, Extra Yard for Teachers (EYFT), elevates the teaching profession by inspiring and empowering quality teachers through the development and implementation of programs in three key focus areas: direct provision of resources, teacher recognition, and professional development training.